The Korean drama craze in the Philippines started in the fall of 2003, when GMA-7 aired “Endless Love”. The series is known as ê°€ì„ë™í™” in Korean or “Autumn Tale” or “Autumn in My Heart”. I saw the series in 2001, before it was even shown on Philippine TV. I made a promise that if I ever get to Korea, I’ll visit the filming locations of my favorite Korean drama and movies. “Autumn in My Heart” stars the beautiful Song Hye Gyo with Won Bin and Song Seung Heon. It is directed by Yoon Seok Ho and is part of the Endless Love series. It is a story of two babies switched at birth, a “fauxcest” relationship and a terminal illness leading to death. The TV series has a sentimental soundtrack. I remember it was one of my favorite CDs that I listened to in 2002. Song Hye Gyo’s character “Eunseo” lived in a small house in Abai Maeul (Hangeul: ì•„ë°”ì´ë§ˆì„), which is home to many people of North Korean ancestry. “Abai” means father while “maeul” means village. I visited that place with my family last June. It is so easy to find Eunseo’s house, which is a store with a large signboard and the words “Eunseo’s house” (Hangeul: ì€ì„œë„¤ì§‘). The store that was used in the drama as Eunseo’s house. Just a few meters from across the house is where Eunseo rode the “gaet-bae” (Hangeul: ê°¯ë°°). This is a small raft that is pulled from the other side with a rope and tourists can get on it for only 200 won one-way. The “gaet-bae” that Eunseo rode in the TV series. At the left side of the boarding area, there is a bronze statue of the lead stars. I remember that Choi Ji Woo and Bae Yong Joon also has a statue in Nami Island for the roles they played in Winter Sonata, which is also directed by Yoon Seok Ho. Located just two blocks from Eunseo’s house is Cheongho Beach. Here is another reminder of the famous scenes in “Autumn in My Heart”. The part of Abai Maeul where “Autumn in My Heart” was filmed is not just a small village anymore. It’s teeming with coffee shops and restaurants offering Abai Maeul’s specialty: Abai sundae. 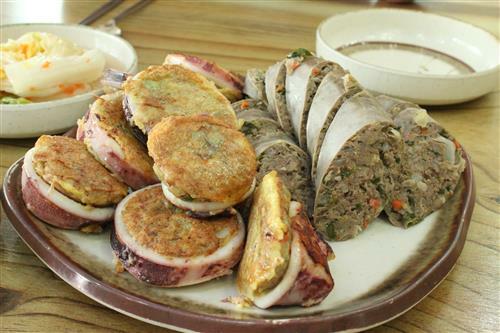 People also visit Abai Maeul to have a taste of Abai sundae and squid sundae. If you’re a fan of this now-classic Korean drama, you shouldn’t miss this special place. It may just be a small village in eastern Korea to some, but for fans of the drama this is where Eunseo lived. Yes! I was able to visit this place last March in Sokcho. How can I get there from Ewha University area? Can you give us directions on how to get there po?